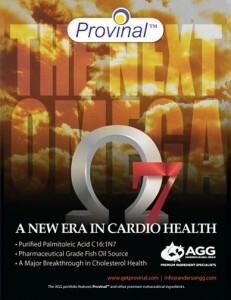 Research on Palmitoleic acid sponsored by Nippon Suisan Kaisha at the Central Research Laboratory in Japan¹ as compared to identical research model published through a joint collaboration of research scientists at the Division of Nephrology, Department of Internal Medicine, Juntendo University School of Medicine, Tokyo, Japan and the Department of Nephrology, Renji Hospital, School of Medicine, Shanghai Jiaotong University, Shanghai, China². EPA – Eicosapentaenoic acid (EPA) has been reported to have beneficial effects on the progression of various renal diseases including diabetic nephropathy; however, the precise mechanisms are not completely understood. The joint collaboration examined the effects of EPA on the early stage of type 2 diabetic nephropathy in KK-Aʸ mice and the possible role of inflammation, oxidative stress, and growth factor in this process. PA – Palmitoleic Acid Studies have demonstrated the beneficial effect of palmitoleic acid (C16:1 n-7) on reducing muscle insulin resistance and preventing beta-cell apoptosis. However, the effect of palmitoleic acid on diabetes remains to be elucidated. The aim of this study was to examine the antidiabetic effect of palmitoleic acid in KK-Aʸ mice, a spontaneous model for studies of obese type 2 diabetes with low insulin sensitivity. EPA – The treatment group was injected with EPA ethyl ester (Epadel from Mochida) at 1 g/kg per day intraperitoneally from 12 to 20 weeks of age and the control group was injected with saline. Renal morphologic examinations were performed after 8 weeks of treatment. PA – KK-Aʸ mice were orally administered 300 mg/kg of palmitoleic acid or 300 mg/kg of palmitic acid (C16:0) on a daily basis for 4 weeks and compared vs. control. After 8 weeks, the EPA dosage of 45 mg daily reduced TG levels in the mice by approximately 44%, while after just 4 weeks the Palmitoleic Acid dosage of 9 mg daily reduced TG levels by approximately 50%. Additionally, the mice administered with palmitoleic acid showed a reduction in body weight increase while those administered with EPA showed no impact on body weight increase. TG levels are expressed in the chart below in mg/dL. At five fold less dosage, in identical animal models, with the same power estimates statistically (similar N’s = 8 & 10 animals tested) Palmitoleic Acid demonstrates very similar to superior effects to those of EPA. Therefore, the data supports that C16:1 ethyl ester is of greater potency than EPA on TG and insulin-like effects in identical mouse animal models. (1) “Effects of eicosapentaenoic acid on the early stage of type 2 diabetic nephropathy in KKAy/Ta mice: involvement of anti-inflammation and antioxidative stress“, Division of Nephrology, Department of Internal Medicine, Juntendo University School of Medicine, Tokyo, Japan and the Department of Nephrology, Renji Hospital, School of Medicine, Shanghai Jiaotong University, Shanghai, China. (2) “Chronic administration of palmitoleic acid reduces insulin resistance and hepatic lipid accumulation in KK-Ay Mice with genetic type 2 diabetes“, Central Research Laboratory, Tokyo Innovation Center, Nippon Suisan Kaisha.